Did You Know: Food History - What is Couscous and How Does One Prepare It? Couscous is one of the staple foods of the Maghrib (western North Africa). Couscous is made from two different sizes of the husked and crushed, but unground, semolina of hard wheat using water to bind them. Semolina is the hard part of the grain of hard wheat (Triticum turgidum var. durum), that resisted the grinding of the relatively primitive medieval millstone. When hard wheat is ground, the endosperm�the floury part of the grain�is cracked into its two parts, the surrounding aleurone with its proteins and mineral salts and the central floury mass, also called the endosperm, which contains the gluten protein that gives hard wheat its unique properties for making couscous and pasta--that is, pasta secca or dried pasta, also called generically macaroni. Couscous is also the name for all of the prepared dishes made from hard wheat or other grains such as barley, millet, sorghum, rice, or maize. 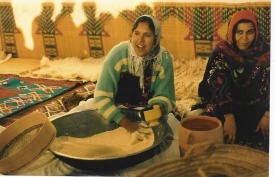 Although the word couscous might derive from the Arabic word kaskasa, "to pound small," it is generally thought to derive from one of the Berber dialects because it does not take the article indicating a foreign language origin. It has also been suggested that the word derives from the Arabic name for the perforated earthenware steamer pot used to steam the couscous, called a kiskis (the French translation couscousi�re is the word English-speaking writers have adopted), while another theory attributes the word couscous to the onomatopoeic--the sound of the steam rising in the couscousi�re, the most unlikely explanation. The key to preparing an authentic couscous is patience and care. Experience will prove the best guide, but these instructions are meant to cut that time down for the novice. There are two basic steps in preparing couscous before the cooking process: forming the couscous and humidifying and drying the couscous. The first of these steps, forming the couscous--that is, preparing couscous from "scratch"--is rarely done anymore, even by Moroccans, Algerians, and Tunisians. Only poorer folk, some rural populations, and Berber tribes still make couscous from scratch. The original "from scratch" process involves rubbing and rolling together large grains of hard wheat semolina with finer grains of semolina sprayed with salted water to raise the humidity of the semolina so the two sizes affix to each other to form couscous, the large grain serving as a kind of nucleus for the smaller grains. But today when one buys couscous, whether you are buying it in North Africa or at a whole food store in this country, in a box or in bulk, this first step has been done, and it is this made-from-scratch couscous you are buying. I recommend buying the bulk couscous rather than the boxed couscous. Boxed couscous is usually pre-cooked too much and the directions often (but not always) require you to boil the product. This so-called instant couscous should not be used for any of the recipes for couscous on this web site or in any of my books. Couscous is always steamed and never boiled. So when a recipe calls for couscous, you will find it sold in bulk bins at whole food or grain stores or boxed without the word "instant" on the package. At the time of this writing (2001) bulk couscous is not sold in American supermarkets, only in whole food stores. In North Africa, there are a variety of couscous products, but in this country you are likely only to find fine wheat (white) couscous and whole wheat couscous. In Morocco, this rolling and rubbing process to form the couscous is done in a platter called a gasca, a large earthenware faience platter traditional in Fez, but sometimes made of wood. In Algeria, this platter is known by the same name, as well as lyān. In Morocco, the couscous is then dried in a midūna, a latticework basket of palm or esparto grass. Afterwards it is transferred to a tabaq, a finer kind of basket. After drying a bit, the couscous is returned to the midūna for more rolling. The couscous is then sieved in three stages through sieves with progressively smaller holes called the ghurbal qamiḥ, ghurbal kusksi, and ghurbal talac in Morocco and Tunisia, and the kharaj, rafaḍ and tanay in Algeria. It is sieved numerous times to form a uniform grain. The couscous is then left for four or five days to dry in the sun on a white sheet with occasional light sprays of water. It must be completely dry before storing. Today, modern North African couscous factories do all of this by machine, including the drying process. The second basic step, which is the only step you need to be concerned with for the couscous you buy, is the moistening process before cooking. Your ultimate goal is to have tender, light couscous swollen with the steam vapors of the particular broth the recipe calls for. Put half the couscous on a large earthenware platter with shallow, angular sides and sprinkle or spray with some salted water (1 cup water salted with 1 � teaspoons salt for every 3 cups couscous) and olive oil ( � cup olive oil for every 3 cups couscous). Work the grains with your fingers to separate and moisten them evenly. Work in a circular rotating motion, constantly raking and forming small �pearls� of soft dough. Rake with one hand and rub with the other, picking the couscous up with your hand and letting it fall back onto the platter, breaking up the lumps as you go. Rake the couscous to form pellets the size of peppercorns. If the mixture becomes too wet, add a little dry couscous and start again. Add the remaining couscous and continue raking with your fingers, adding water and oil as needed. Continue in this manner until all the grains are moistened. The couscous should be evenly wet, not soggy, and uniform in size, about 3 millimeters in diameter. It may be necessary to shake the couscous through a flat sieve, breaking apart any pellets with your hand. You may wish to sieve two to three times to make sure each pellet is separate. On the other hand, you can get each pellet to its correct size by lengthening the raking and rubbing time. The final size of each pellet should, ideally, be about 1 millimeter in diameter and the pellets should be separate from one another. If you have not achieved this, rub and rake some more. Arrange the couscous on white kitchen towels and leave to dry for 1 to 2 hours, depending on the humidity that day. With your fingers, rub the couscous with olive oil. Couscous is steamed one, two, or three times over broth. The number of times one steams is based on cultural preferences. I always steam couscous at least twice, but only because that is how I was taught by Tunisian and Algerian friends. The couscous is never submerged in the liquid; it is always steamed. Couscous is cooked in a special kind of cooking ensemble called a kiskis, known by the French word couscousi�re in the West, except in Italy, where it is called a couscousiera. A kiskis consists of two parts: the bottom portion is a pot-bellied vessel for the broth while the top part fits snugly over the bottom part and has holes in its bottom for the steam to rise through, which cooks the couscous. In North Africa, they are often made of earthenware or aluminum. Fine kitchenware stores, such as Williams-Sonoma or Sur la Table, sell aluminum couscousi�res. A makeshift couscousi�re can be made by placing a colander over a like-sized pot. The Berbers of Morocco call this bottom portion the ikineksu, while the top potion is the tikint, the bottom portion of the kiskis or couscousi�re is called a makfūl in Tunisia, a pignata in western Sicily, and a qidra in Morocco and Algeria. The top portion is also called a kiskis in Morocco, Algeria, and Tunisia. Cover the holes of the top portion of the couscousi�re with cheesecloth and transfer the couscous on top of the cheesecloth. The reason I recommend using the cheesecloth is not because the grains fall through the holes (they don�t) but because it is easier to move the couscous around for its several dryings. Add whatever spices, herbs, vegetables, meat or fish the recipe calls for, if any, and bring the water or broth in the bottom portion of the couscousi�re to a gentle boil. Mix the couscous gently. Mix � cup flour with enough water to form a dough that can be rolled out into a rope as you would roll out play dough. This flour-and-water rope is used to seal the top and bottom portions of the couscousi�re together so steam doesn�t escape. (This step is not always necessary and is up to the cook, depending on how much steam appears to be escaping.) Cook over low heat for 1 hour. Remove the couscous to a large platter and rub with salted water or butter or whatever the recipe calls for and leave to cool 15 to 30 minutes. This step is necessary; the initial steaming should not be too long because you do not want the couscous to become sticky and form a pasty dough. Traditionally, the cook knows the couscous is done when the sound of a spoon hit against the kiskis, the top portion of the couscousi�re, makes a �heavy, coarse� (so they say) sound. The way I tell whether the couscous is done is by tasting it. The couscous should taste tender, not al dente and not mushy, the grains should be separate and taste moist, not wet and not dry. Put the couscous back into the top portion of the couscousi�re and steam another 30 minutes. This second steaming can continue until the couscous is fully cooked. The couscous can rest for 30 minutes, covered, if desired, before serving. Some Algerian cooks steam the couscous a third time. Now that you�ve read this process, I imagine you�ve decided that it is too much work. But let me say, lastly, that although this is really a lot of fun, you should not feel rushed when you make it, so preparing couscous for the first time is best done on a cold or rainy day when you know you�ll be indoors all day. Once you�ve made the authentic North African couscous you�ll wonder what all the fuss is in my instructions. Why, it�s so easy! (Also see The History of Couscous).